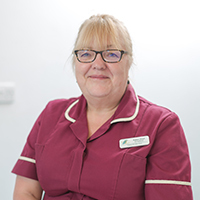 Karen started work part time at the Loddon practice in 1997 and joined us full time in 1998. She has worked here since and is very experienced in reception. Karen also deals with ordering and stock control and general clerical duties. Outside working hours Karen enjoys holidaying with husband Keith in Scotland and spending time with her grandchildren.